Lansing, MI Police and Court Consolidation Study - Redstone Architects Inc. In 2010 Redstone Architects, law enforcement consultant, and C2AE of Lansing, MI programmed the consolidation of the Lansing Police Department Headquarters and its two precincts into a single facility on the former Michigan National Guard Facility (“MNGF”) site on South Washington Street. The 54A District Court was to vacate its current location and relocate to this site. In 2015, as part of courts and Law Enforcement Consolidation Study for Ingham County, Redstone updated both studies to determine the possibility of collaborating on facilities. 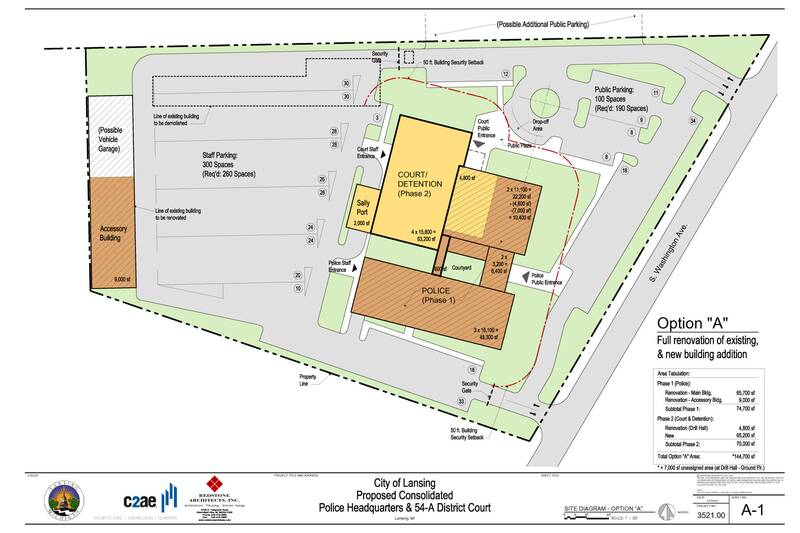 In 2018, as part of an updated City of Lansing and Ingham County study to look at a Lansing Booking Facility to be run by Ingham County, Redstone Architects updated the program for the 54A District Court to determine where it might be relocated when it moves from its current location at City Hall. The Study looked at the Veterans Memorial Court House (VMCH) site, which houses the Ingham County Circuit Court, as well as two other possible locations. A shared Lansing booking facility was also investigated at the VMCH.